With the clocks changing back this weekend, it seems like an appropriate time to review one of my favourite baby products. 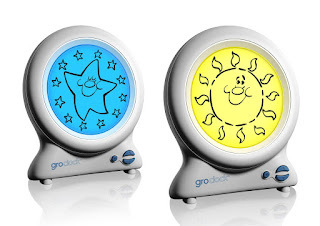 The Gro Clock. It wasn't the first to market in terms of sleep training or time setting devices, there have been bunnies who wake up and sheep which light up in the morning etc etc. Over the years and I have seen several of them used with various families I have worked with. 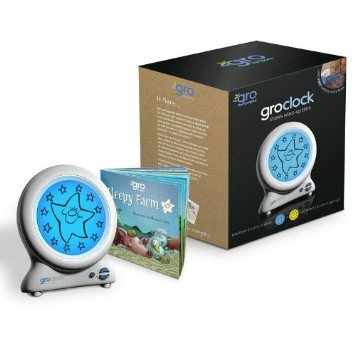 I decided to go for the Gro-Clock because I am a fan of the company anyway, I like their Gro-bags, their general ethos and one mother I worked with raved about it. So the idea is that when your child goes to bed you switch from the sun to the star, the star then has little stars around the edge which count down through the night until the sun comes back at the time you have allocated - like an alarm clock. We dress this up as Mr Sunshine and Twinkle Twinkle - if I'm honest, no discussion or thought went into these names, I think one of us said it once and it has stuck! So when Seb goes to bed we press the button and say 'Goodnight Mr Sunshine!' usually followed by 'Oh look! Who is there now?' To which the standard response is 'Twinkle Twinkle!' With surprising glee considering that this is a routine we have now followed for about 4 or 5 months. Seb, or ninja child as he is sometimes known, climbs out of his cot so we encourage him to stay in bed whilst Twinkle Twinkle is on the clock. Generally speaking in the morning this works and he often runs in to our room say 'Mr Sunshine's up!' Our once perfect evening routine doesn't always follow suit and for some reason he is currently a fan of climbing out of bed several times before eventually realising that we really mean it... it is bed time and giving into sleep. I think the clock is easy to use, though my husband would disagree (which one of us do you think read the manual?) and the graphics are large and clear. There are three buttons total, an enter or return button and two arrows, so it requires two button clicks to turn it to the Sun and then to the star; I think this is what he struggles with for some reason. There is a setting for day time sleeps but if I'm perfectly honest I have never really used this, if I do decide it's necessary because he's being a monkey and not sleeping then I usually just use the night time mode and switch it to the sun when I come back in to get him up. The Gro-Clock also comes with a book that helps you to introduce the clock to your child. Personally I read the book to Seb once and with our discussions about it he got it and didn't need it covered again, but other children might benefit from visiting the story a few times. It is not such an amazing story that you'll want to read it again and again though! So with the clocks changing this weekend, you may find this clock is your best friend. Just make sure you change the time before you go to bed and in theory your little one will stay in bed until the Sun comes up! Otherwise you may find your little 6am waker suddenly shouting out or appearing next to you at 5am GMT! They are very reasonably priced at around £19.99, though if you buy on Amazon I have seen them there for £14.99 in one of their prime day deals.